We have followed 'Chico Viola Awards' from 1958 through 1967. The yearly Award presentation used to be eagerly anticipated by those who won the trophies as well as the thousands upon thousands who watched the gala on TV in the first few weeks of the new year. TV Record usually put on a great big show surpassed only by the presentation of TV's own Roquette Pinto Award (Brazilian equivalent of US's Emmys) a few weeks later. Since mid-1965, TV Record started a winning series of musical shows that would re-definy local show business. June 1965 saw the beginning of 'O fino da bossa' with Elis Regina at the helm. In August 1965 it was Brazilian rock's turn to have its weekly show in 'Jovem Guarda' with Roberto Carlos acting as presenter. 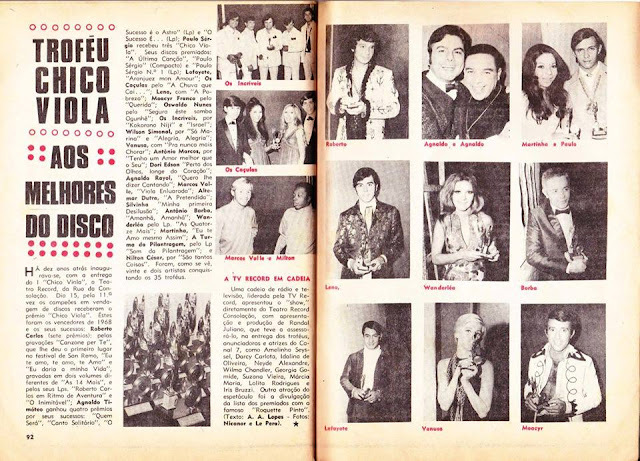 TV Record would eventually cater for all kinds of musical preferences in the Brazilian spectrum making it the most popular TV station in the nation from 1965 to 1968. By 1969, the Military Dictatorship that ruled the country with an iron fist since 1964, had a new darling called TV Globo owned by a politically conservative family that had a small radio station and a newspaper in Rio de Janeiro. TV Globo was awarded a huge loan by Time-Life Inc. It had the best equipment brought in from the USA and soon would become a monopoly - the only TV network in the country. The other 3 networks knew they were losing ground. TV Excelsior was the first to fold. TV Tupi would be the next and TV Record was eventually sold to an electronic calvinist church. But before TV Record was sold out it had a slow death. This 1969 ceremony of Chico Viola's Best of 1968 is an example of its decadence. The format of the Awards - which up to 2 years before only awarded the Best Selling Singles - was changed to awarding (some) albums and (some) extended-plays in a desultory way. Up to 1965, receiving a Chico Viola meant one had achieved excellency. Now, just look at the 1968 list and you'll see it doesn't represent the best in Brazilian music. Somehow something was amiss. Differently from previous years, TV Record did not award any foreign-made recording. No foreign acts were given the trophy. It doesn't mean there were not foreign hits. On the contrary, Anglo-American music was everywhere and getting bigger. São Paulo's Radio Difusora and Radio Excelsior went American-Top-40 in the beginning of the year. Both radio stations would play only US or British hits 24 hours a day. But you won't see that here. The impression one gets looking at 1968's Chico Viola's list is that TV Record called the 3 big multinational record labels - Columbia's CBS, EMI's Odeon & RCA Victor - and divided the Awards in 4 parts, giving each a quarter. 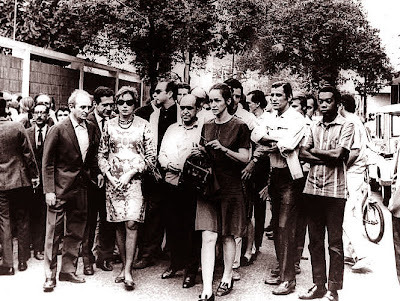 The last quarter was meagerly divided among the few independent labels like Rio de Janeiro's Caravelle and Equipe; Recife's Mocambo's subsidiary UA and São Paulo's RGE that had been big in the early 1960s but could not compete with the multinationals anymore. What was new in 1968? Not much! It was just a boring repetition of trends started in 1965 like 'Jovem Guarda' or easy-listening acts like Agnaldo Timoteo and Agnaldo Rayol who recorded mostly covers of European hits. Roberto Carlos was the best selling Brazilian act for the 3rd year in a row. Early in 1968, he went to Italy to sing at the famous San Remo Festival. He was extremely lucky to have been paired off with magnificent Sergio Endrigo who ended up winning the Festival with 'Canzone per te' (Song for you). It looked like Roberto Carlos could do nothing wrong even if he wanted to. CBS usually released a Roberto Carlos album near Christmas. 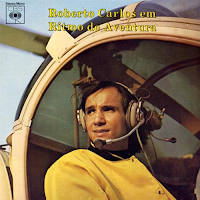 'Roberto Carlos em ritmo de aventura' was released late in 1967 and played the whole of 1968. It was the sound-track of Roberto's first and only film of the same name. 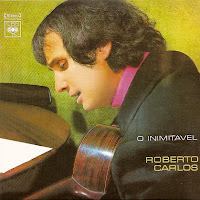 As Chico Viola Award's ceremony was delayed due to unknown reasons the panel who chose who would get what decided to include Roberto Carlos' yearly album 'O inimitável', released in late December 1968 that technically would qualify only for 1969. Well, never mind the faux pas; things were getting a bit out of hand by March 1969 anyway. 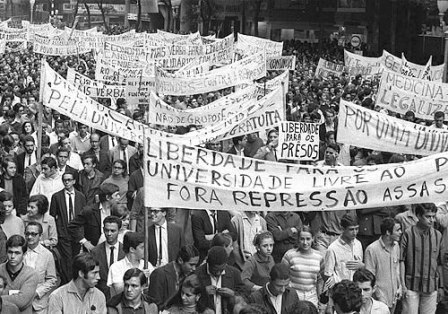 Brazil had suffered another political setback in December 1968, when the already bloody Military Dictatorship turned the screws even tighter against freedom when they issued the infamous AI-5 (Institutional Act no. 5) which shut down the already emasculated Congress and suspended habeas corpus or any kind of individual freedom. Brazilians lived in a Dark Age. Military strongman Costa e Silva sits alone in the National Congress which he shut down with a stroke of his pen in December 1968. Lafayette Coelho Varges Limp (the guy in the middle climbing down the ladders of an Aerolíneas Argentinas air-plane) was an organist who accompanied most of CBS's young acts. He must have saved Columbia a bundle for he was a whole orchestra himself. Lafayette, as he was known recorded album after album. This time he hit the singles charts too with 'Aranjuez mon amour' which had been a smash-hit for French-Egyptian Richard Anthony. 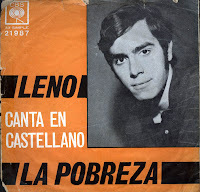 Leno or Gileno had been half of duo Leno & Lilian for 3 years; now he went solo and hit #1 with 'A pobreza' (Destitution) also accompanied by Lafayette on his ubiquitous organ. 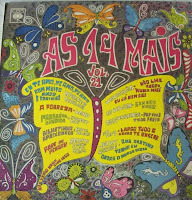 CBS's album 'As 14 Mais - Volume 21' was release mid-1968 and went to #1 in the album charts. It got a Chico Viola which was given to Wanderléa who sings 'Eu já nem sei' - a hit for her in the singles charts even though she didn't get a personal trophy. It is plain to see that CBS was the most popular record label in 1968 and that Lafayette's organ was in 90% of all the label's recordings. Paulo Sergio, a struggling young singer from Espirito Santo who recorded for Caravelle a small label in Rio de Janeiro suddenly becomes pop music's new sensation with 'Ultima canção', a cantankerous ballad about unrequited love. 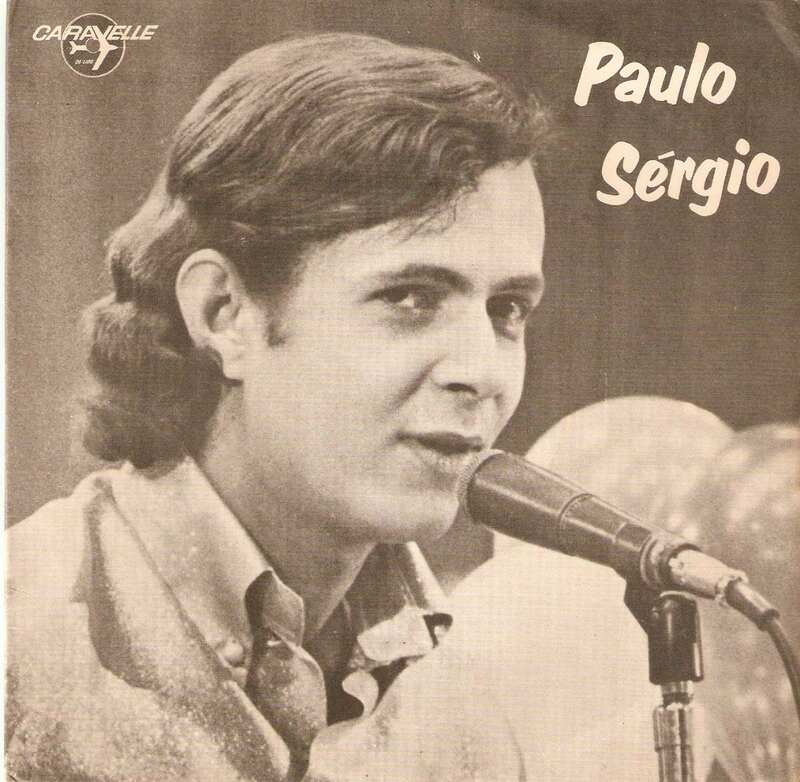 Paulo's voice was astonishingly similar to that of Roberto Carlos, Brazilian King of Rock - don't forget that 'Brazilian rock' was much softer than its American counter-part. Actually you could not tell Paulo and Roberto apart unless you knew their repertoires. By the end of the year Paulo Sergio had already released a full album and an EP, both reaching #1. Roberto Carlos' label was so incensed with Caravelle's rip-off that it didn't waste time: by December CBS released 'O inimitável' (The Un-imitable) in response to Paulo Sergio's inroads into 'ié-ié-ié' - as Brazilian rock was known then. 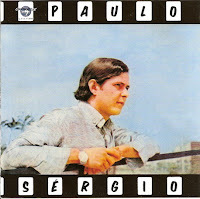 Paulo Sergio's 1st album was filled with self-pity and love-gone-wrong songs. Paulo would be considered a 'poorer' Roberto Carlos and would have a successful career cut short by a massive stroke (Cerebro-Vascular-Accident) in July 1980 dying at the age of 36. 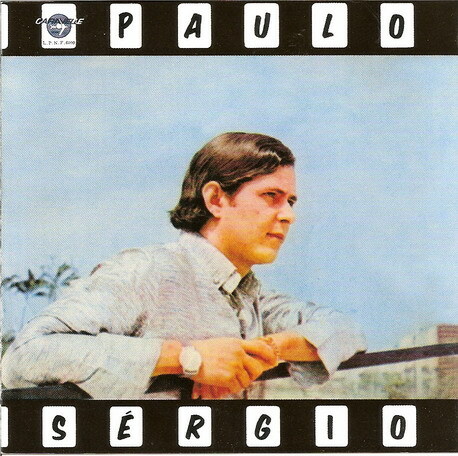 'The inimitable' was CBS's response to Paulo Sergio's #1 single, EP and album. For those who like what's been called 'brega' - songs and singers with a pench for 'kitsch' (cafona) songs or themes - 1968 could be considered as the year 'brega' was born. What's 'brega' really? It is difficult to describe but one can easily say that Agnaldo Timoteo and Agnaldo Rayol are both 'brega'. Paulo Sergio too! 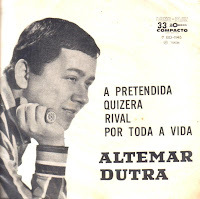 Altemar Dutra is definetely 'brega'. Nilton Cesar too. Actually, looking at Chico Viola's 1968 list it is easier to tell what act is not brega than the other way around. RCA Victor came in 2nd place after CBS but if one really looks closer one will see that EMI's Odeon sold more records (LPs and EPs) than RCA. 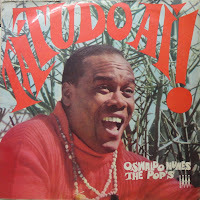 Odeon actually had a big act in Agnaldo Timoteo who sold singles: 'Quem será? ', 'Verdes campos de minha terra' (Tom Jones' 'Green, green grass of home') but also EPs and LPs. Timoteo was awarded trophies for 2 albums: 1967's 'O sucesso é o astro' and 1968's 'O sucesso é Agnaldo Timoteo'; one EP 'Canto solitário' and 1 single: 'Quem será?'. 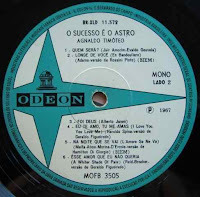 Odeon didn't have to work too much to produce an Agnaldo Timoteo album: just get yourself some writer to 'translate' European hits into Portuguese and that's it! 'O sucesso é o astro' is made up of adaptations of Adamo’s ‘En bandoulière’ and ‘N’est ce pa merveilleux? ; Carmelo Pagano’s ‘L’amore se ne va’; Procol Harum’s ‘A whiter shade of pale’; Armando Manzanero’s ‘No’; Charles Chaplin’s ‘This is my song’ plus ‘Love letters, ‘I love you, you love me and ‘Per una donna’. 9 covers and 3 originals. 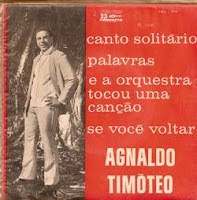 Agnaldo Timoteo received 4 Chico Violas: 2 albums, 1 extended-play and 1 single. 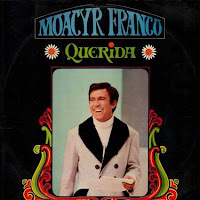 Moacyr Franco had been on top in 1962 & 1963, but fell from grace with the advent of the modern Italian music in 1964; modern Brazilian music aka MPB in 1965; Brazilian rock aka Jovem Guarda in 1966 and pop music festivals in 1967. Moacyr was back in 1968 with the same old formula of translating/adapting European or North-american hits to Portuguese. This time he chose ‘Honey’, Bobby Goldsboro’s sad tale of losing his wife to cancer. But unfortunately song-translator Fred Jorge couldn’t handle the original idea and wrote a lot of platitudes and non-sense instead. Even so, ‘Querida’ was a local hit. Moacyr's idea of making an album was to translate 7 or 8 foreign hits and then make up the rest with local material. The album 'Querida' has got 7 'translations': 1. 'Honey'; 2. 'The apartment'; 3. 'What would I be? '; 4. 'Tengo para darte'; 5. 'All I see is you'; 6. O.C. Smith's 'Little green apples'; 7. Pino Donaggio's 'Io, per amore'; 8. 'Autumn of my life'. Agnaldo Rayol's sings Dictator's Costa e Silva's favourite tunes in an album released in 1968. 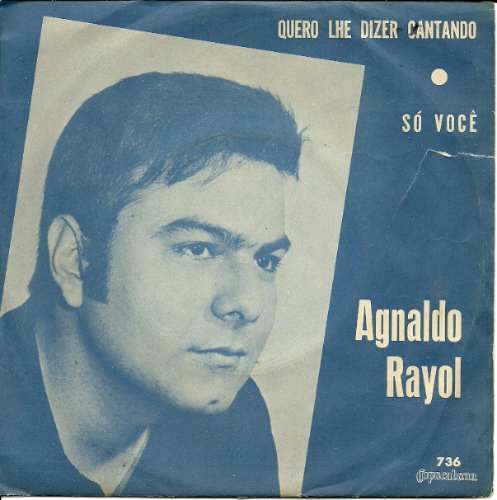 Agnaldo Rayol had been very popular until recently. He actually had his own ‘Corte-Royal Show’, a variety TV programme that aired every Friday night which had been the top dog for 1966 and 1967. But Agnaldo, who recorded for Copacabana, was getting a lot of competition from his name-sake Agnaldo Timóteo from EMI’s Odeon... and Rayol was losing the fight. Copacabana was the recording label for the brainless and gutless. 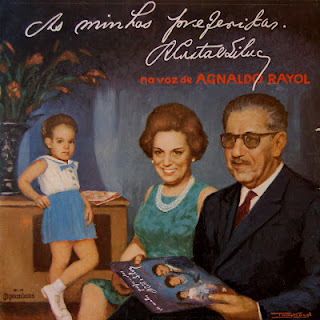 Rayol had the temerity of recording a whole album with Dictator Arthur Costa e Silva’s favourite songs which showed a lot of opportunism on the part of both the label and the singer himself. 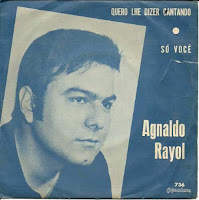 Agnaldo Rayol's 'Quero lhe dizer cantando', his hit for 1968. Talking about ‘middle-of-the-road’ easy listening acts, Altemar Dutra was still churning out hits – this time Pepe Ávila’s ‘A pretendida’ – even though with less regularity than he did in 1964 and 1965. 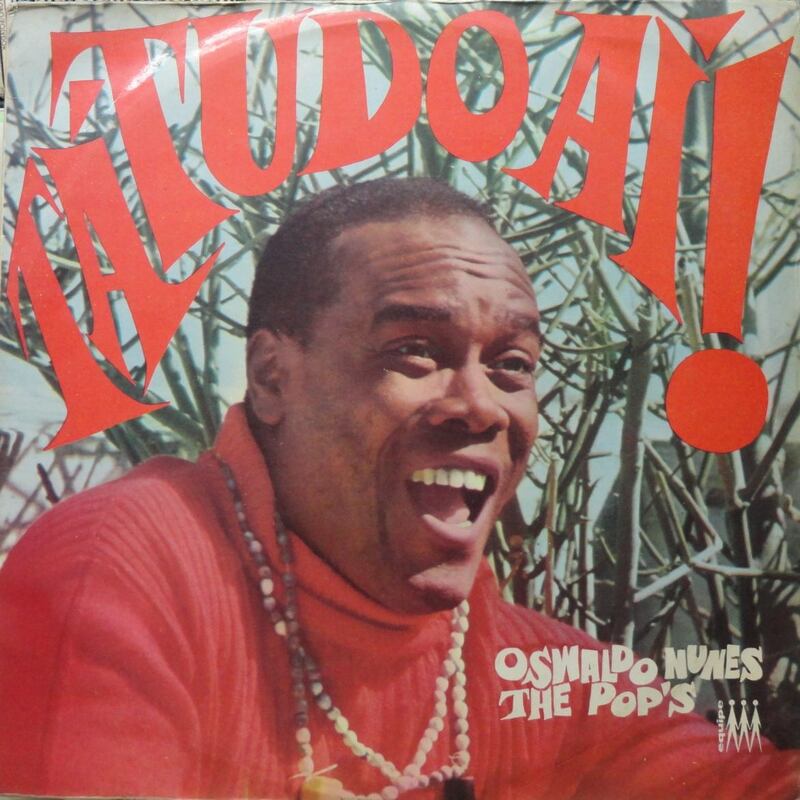 The big surprise of the year-with-no-surprises was Oswaldo Nunes’ ‘Segura esse samba, Ogunhê’, which is supposedly half secular and half Afro-religious. Ogunhê could be reference to Ogum, an Afro deity who lords over war - but I'm not sure about it. It was the one and only samba at 1968's Chico Viola. Oswaldo Nunes didn't know who his father or mother were. He grew up on the streets or government 'workhouses'. There is not much information about him in the Net except that he was murdered at Rio's Lapa in 'suspicous circumstances' in 1979. Os Incriveis in 1967; Risonho, Manito, Nenê, Netinho, a fan & Mingo. 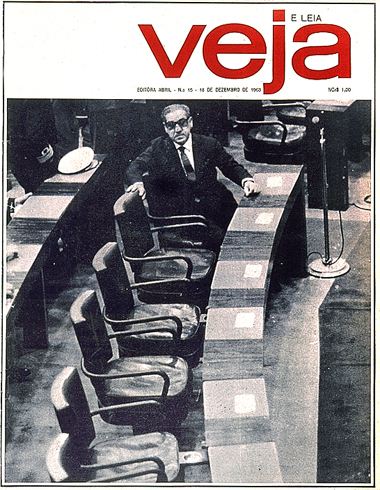 Os Incríveis in Japan in 1967. They recorded 'Kokorono Niji' in Portuguese and Japanese. RCA had a good year with Os Incriveis, a rock band that started in 1963, at Continental Discos as The Clevers, an instrumental combo, then changed its name in 1965, due to a litigation with their manager. They changed their bass-player and started singing their hits. They accompanied Rita Pavone on a tour of Italy in 1964, then had a soujourn in Argentina in 1965 and in Japan in 1967. 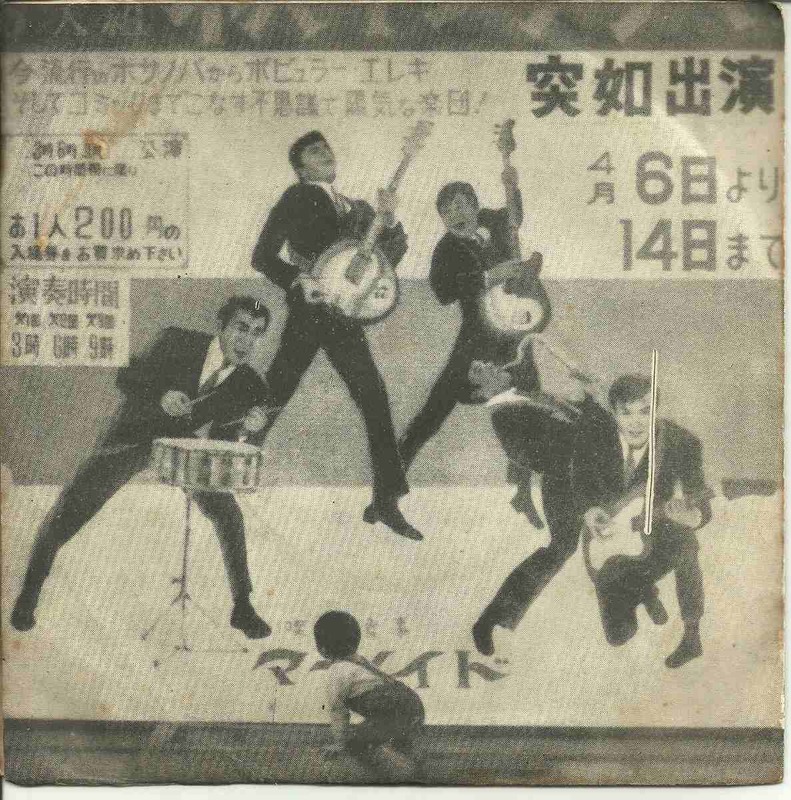 On their way back to Brazil, they recorded 'Kokorono Niji' (Blue rainbow) which sold well. They also had a double-sided hit with 'Israel', a translation of an Italian hit done originally by Gianni Morandi backed with 'Molambo' (a 1950s hit done orginally by Roberto Luna) very much influenced by those Chris Montez's hits like 'The more I see you', produced by Herb Alpert for his A&M label. Antonio Marcos was a good looking young man with a chip on his shoulder. He was moody and had an atittude like 'the world has done me wrong'. He was very talented and could write beautiful songs that he gave other people to sing (Roberto Carlos sang his 'E não vou deixar mais você tão só' and 'Como vai você'). RCA invested a lot of their resources into Brazilian rock's Jovem Guarda and it looked like it paid off. New comer Vanusa, a blonde girl from Minas Gerais went to #1 with Carlos Imperial's 'P'ra nunca mais chorar'. 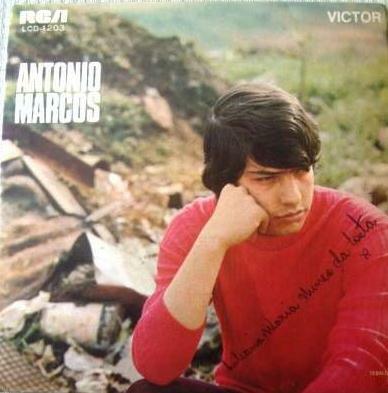 Antonio Marcos, who had been one of Os Iguais, a vocal group signed by RCA, went solo with Roberto Carlos' 'Tenho um amor melhor que o seu' (I've got a love better than yours). Vocal group Os Caçulas went gold with Bob Lind's 'Remember the rain' that was first translated into Italian by Mogol (È la pioggia che va) for The Rokes and then translated by Antonio Marcos into Portuguese as 'E a chuva cairá'. Dori Edson started in 1960, recording in English for Young Records, actually sharing a 45 rpm with his friend Marcos Roberto who took the B-side. 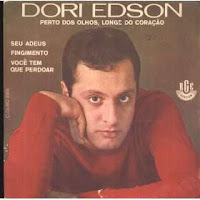 Then he went into a period of obscurity until 1966 when Dori hit with 'Veja se me esquece' and now melodious 'Perto dos olhos, longe do coração' (Near the eyes but far from the heart) which he wrote with his old pal Marcos Roberto. They had a life-long friendship and musical partnership until Edson died in 26 AUG 2008. Marcos Roberto died 4 year later in 22 JUL 2012. Silvia aka Silvinha, just like Vanusa, was blonde and hailing from land-locked Minas Gerais. Both sang Brazilian rock aka Jovem Guarda but had different styles. Silvinha had a high-pitched voice and was a goody-two-shoes sort of wholesome girl whereas Vanusa had a hot voice and exuded sexuality. 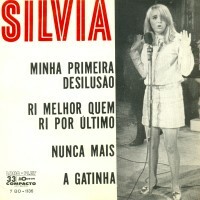 Silvia's first hit was 'Minha primeira desilusão' (My first heartbreak). 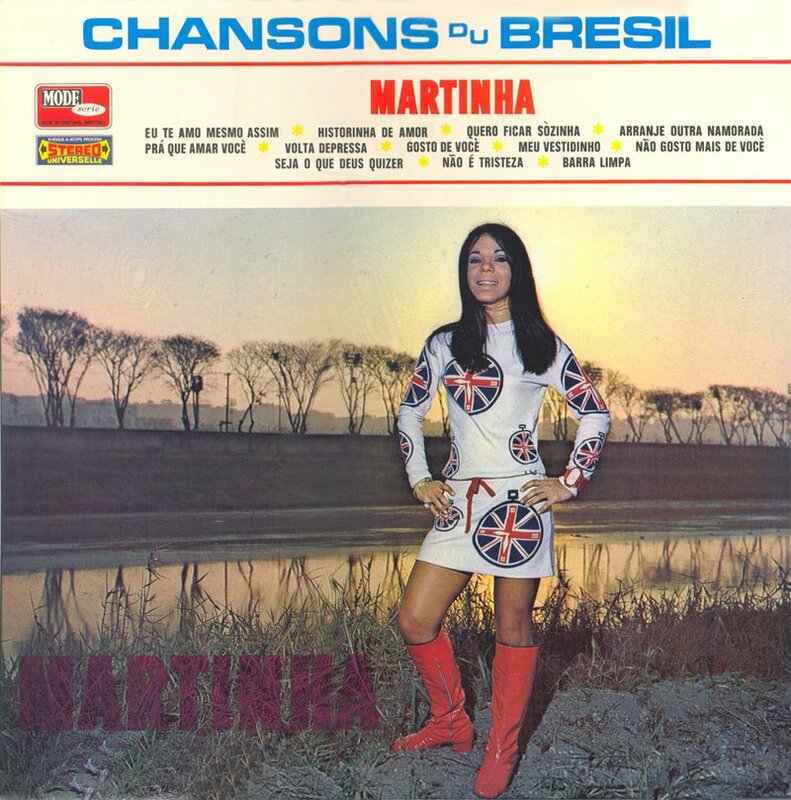 Martinha wearing the Union Jack all over her. Talking about Minas Gerais, Martinha was bigger than Vanusa or Silvinha. Martinha was a song-writer on top of being a singer and Roberto Carlos had already recorded 'Eu daria a minha vida', one of her best songs. 'Eu te amo mesmo assim', Martinha's very first single went straight to #1 and her subsequent album went all the way to #1 too. Simonal saying: 'I can't hear you! Would you please sing a little louder?' That's how he conducted his shows. He commanded huge audiences and made them sing along with him. Sometimes the crowd sang in his lieu.That's how good he was! In 1968, Wilson Simonal had come a long way from his humble beginnings in Tijuca, Rio de Janeiro trying to be a rock singer at DJ Carlos Imperial's radio show 'Os brotos comandam'. 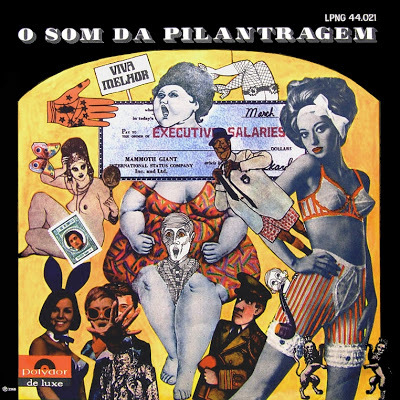 Simonal changed his outlook after Jorge Ben became the toast-of-town with 'Samba Esquema Novo' (New Scheme Samba), his ground-breaking album for Philips in 1963. Simonal, who had been under contract with EMI's Odeon was immediately recruited to change tack and record 'serious' Brazilian bossa-nova. Soon Simonal hit the charts with 'Lobo bobo', a single taken out of 'A Nova Dimensão do Samba' (Samba's New Dimension) his 2nd album for Odeon. Simonal didn't write his own material like Ben, but he was hot and could swing. TV Tupi signed him for 'Spot ligth', a weekly Sunday night jazz show. When Elis Regina went to Europe in December 1965, Wilson was invited to present a few instalments of weekly 'O Fino da Bossa' on TV Record. In June 1966, TV Record started Simonal's own programme called 'Show em Si...monal' where he would be backed by Som Três, pianist Cesar Camargo Mariano's jazz combo. Simonal recorded a few good albums for Odeon. As he was extremely talented as a singer and as a performer he built up a knack for controlling the crowds he sang to. Musically he could swing from samba to jazz or bossa-nova or even rock-oriented tunes. Around 1968, he had come to be identified with a crowd that was a little right-of-the-centre of the political spectrum. There were those like Geraldo Vandré and Chico Buarque who were in the left. Most of Brazilian rock's Jovem Guarda would be identified as 'right-of-centre'. Simonal was something in between. Carlos Imperial, his former mentor was definitely a man of the right... with a devil-may-care attitude. 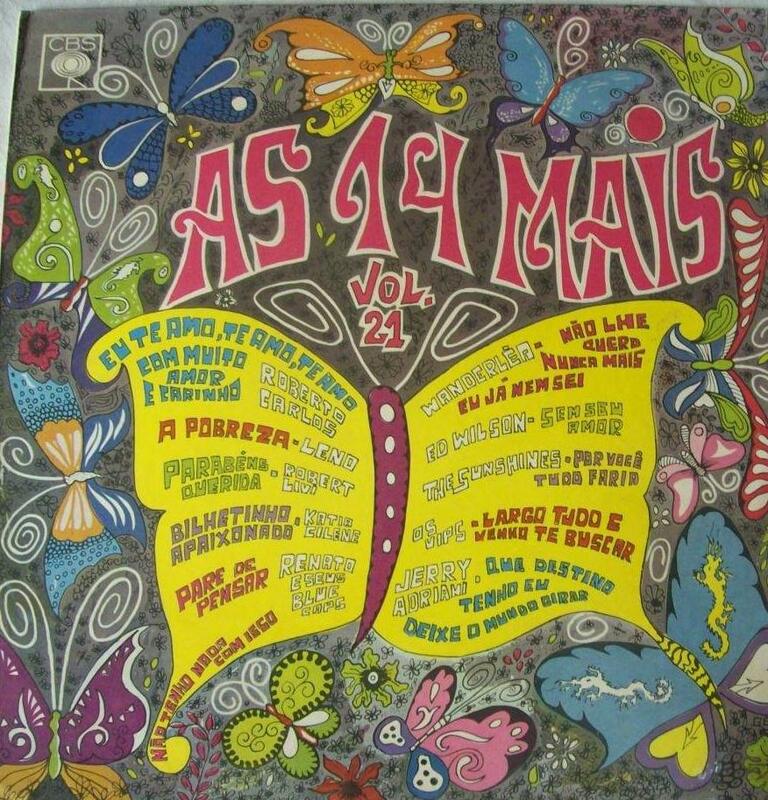 Brazilian music as Brazilian politics in general was coming to a water-shed in 1968. Traditional Brazilian musicians abhorred the use of electric guitar and rock influence. Caetano Veloso and Gilberto Gil, who were part of the traditionalists suddenly broke up with them in 1967, and all hell broke loose. Suddenly there were two camps: those for and those against 'electric guitar' usage in pop music. 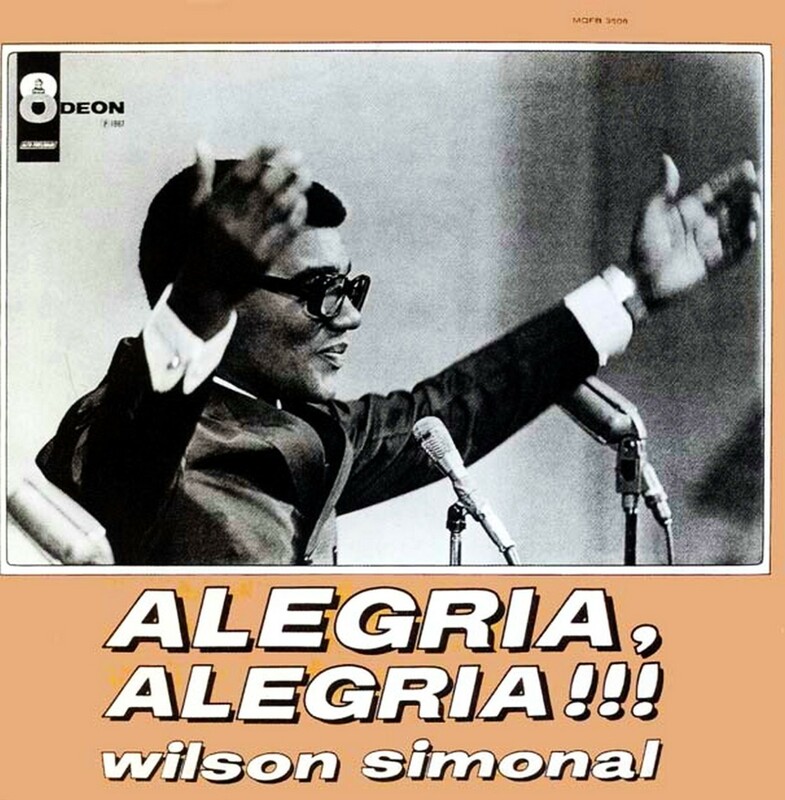 Simonal not only was for total freedom in musical terms but lyrically free as well. Carlos Imperial (Nem vem que não tem) and Nonato Buzar (Vesti azul) started writing songs about 'what-the-hell-do-we-care' as long as I've got my big car and some chicks waiting for me down the line. This was a typical atittude of a 'pilantra' that loosely translates as 'rascal' in English. Pilantragem was rascality. The songs were all about 'having fun' in a hedonist way. Selfishness was king! Musically they were songs easy to sing along. If one listens really hard to 'pilantragem' one is bound to realize the influence of Herb Alpert's production of Chris Montez records for his A&M label. It looked like the whole world was a big night-club with everyone clapping their hands in rhythm. The most amazing of all is that all this Pilantragem stuff was that it was happening in 1968, when the bloody right-wind Dictatorship was about to become even more sinister with the shutting down of Congress and imposition of draconic laws that would encarcerate lots of people. It was just like living merrily in 1933's Berlin, with Hitler's Gestapo knocking at your door. Wilson Simonal commanding his weekly TV show at TV Record. He had total power over the crowd he sang to. He was a complete entertainer. He could swing! But he ended up getting mixed up with the wrong crowd in the end and fell from grace a few years later. Turma da Pilantragem (Gang of Rascals) was a band created by song-writer and record-producer Nonato Buzar made up of 10 singers and musicians like Pedrinho Rodrigues, Cassiano and Regininha to cash in on Wilson Simonal's style of singing with a devil-may-care-attitude. 'O Som da Pilantragem' is an album of 13 tracks of medleys of old hits performed in a danceable way. See the song-list to have an idea what they meant. 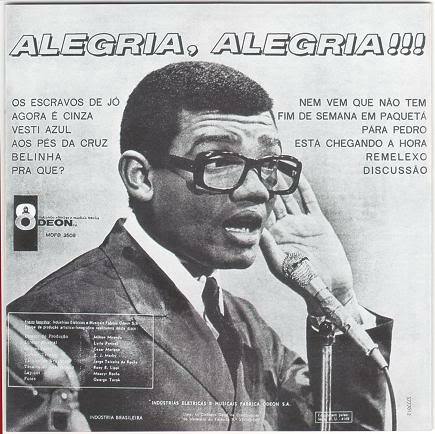 Turma da Pilantragem had a follow-up album and then disbanded with no regrets on the part of anyone. April 1969 issue of 'Melodias' with full report of Chico Viola's 1968 award recipients. The ceremony was held in 15 March 1969. 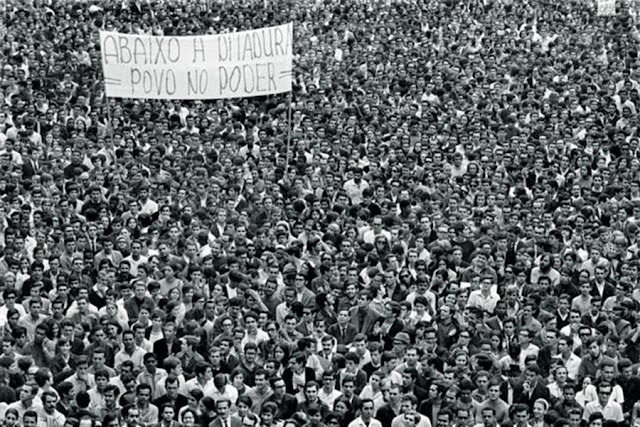 100,000 march against Censorship & Police Brutality - in Rio de Janeiro in 26 June 1968. Author Clarice Lispector, architect Oscar Niemeyer, actress Glauce Rocha and singer-song-writer Milton Nascimento. 100,000 march against the Military Dictatorship in Rio de Janeiro - 26 June 1968. 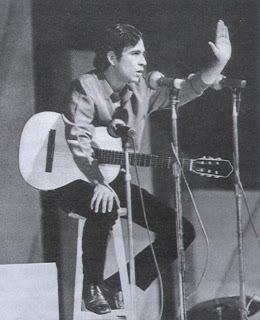 Geraldo Vandré tries to calm the crowd in Maracanãzinho, Rio de Janeiro before he sings 'Caminhando' or 'P'ra não dizer que não falei de flores' in 28 September 1968. 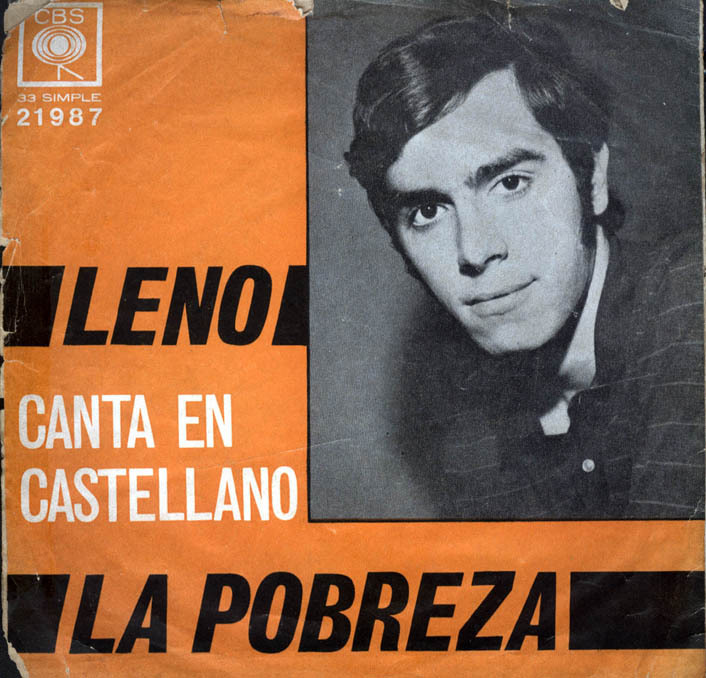 The military censors would not allow the song to win the International Song Festival of that year and the record was banned in December 1968 as soon as infamous Institutional Act 5 was enacted by the Dictatorship.